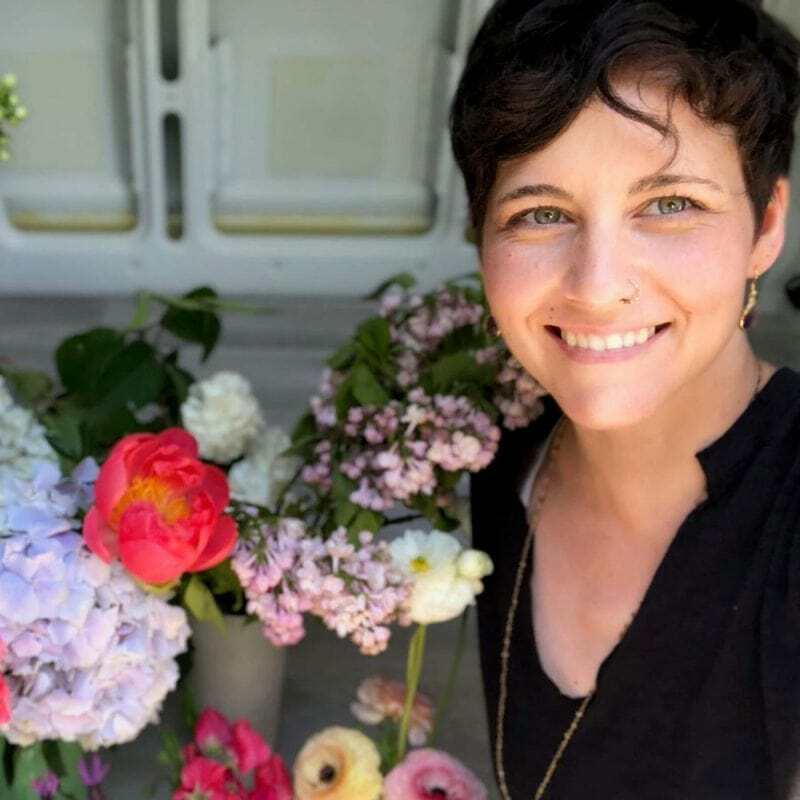 Chelsea Willis of Sweet Delilah Farm has a special connection with flowers. It’s almost as if she communicates with them instinctively. Chelsea pays attention to how her flowers grow and respond, and then she nurtures them into beautiful, thriving plants to share with Portland. I recently visited Chelsea at her farm in the Cully Neighborhood. As I walked through the gate into her farm, I immediately knew I had entered a space where plants thrive. I smelled the beautiful mixture of scents from a variety of flowers. The sounds of bees, insects and birds filled my ears. I could almost see the plants smiling. Sweet Delilah Farm was more than a farm, but a haven for plants and the lives they support, right in the middle of the city. Chelsea started the farm just last season. She had been volunteering at The Side Yard Farm and wanted to spend more time working the land and to give that opportunity to youth in the city. So, she found the time between two jobs to work a piece of land herself. She found a parcel to lease in Cully and went to work. Chelsea planted flowers and herbs and started to pay attention. She watered them and watched what her flowers did. She cut them at different stages of their life cycle and noticed how they responded. She noticed when certain plants thrived better in sun or shade. Chelsea tells me she taught herself how to grow the flowers, but I get the feeling she just instinctively knew how to listen to her plants and follow their cues. Chelsea Willis is passionate about providing local flowers to the people in Portland. Chelsea explained that most flowers we see in florist shops or grocery stores come from South America. I had no idea! These flowers are generally sprayed with chemicals and other substances to keep them fresh. On the other hand, Chelsea’s flowers are not sprayed and come fresh from the farm. Imported flowers tend not to last very long due to their long journey. Local flowers, Chelsea says, last longer because they are fresher. Also, Chelsea has learned when to cut her flowers for them to stay fresh for the longest period of time. Chelsea gave me a beautiful bunch of flowers when I left. And yes, they brightened my kitchen table for longer than most flowers I get. 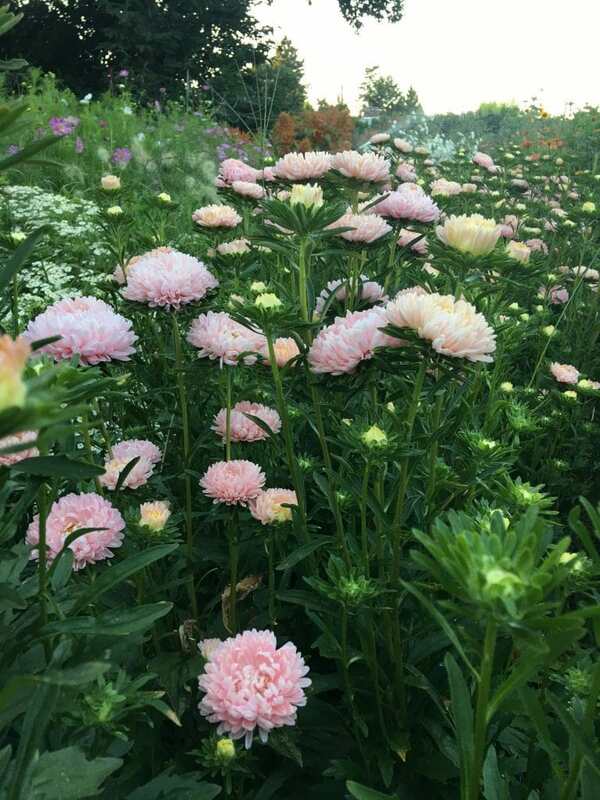 Chelsea grows an amazing variety of flowers and herbs at Sweet Delilah Farm. She simply started growing what she likes and finds interesting. For example, she’s got flowers and plants with different textures. Some plants are native to the area. Chelsea says she’s got different plants blooming throughout the season. And, she’ll even grow specific plants for couples looking for something special at their wedding ceremonies. In fact, Chelsea has also studied floral design and is a certified FDIC wedding florist. She tells me her mother worked a lot with flowers, so Chelsea developed an interest in flowers early in life. Chelsea loved creating arrangements before she even had any formal training. But, Sweet Delilah Farm isn’t only about flowers. Chelsea also grows medicinal herbs at the farm. She sells some of the herbs to local apothecaries and herbalists, and she also harvests some of the flowers they produce. Like with her flower garden, Chelsea grows a wide variety of herbs. Sweet Delilah Farm brings flowers to the people. Of course, there’s the flower truck. 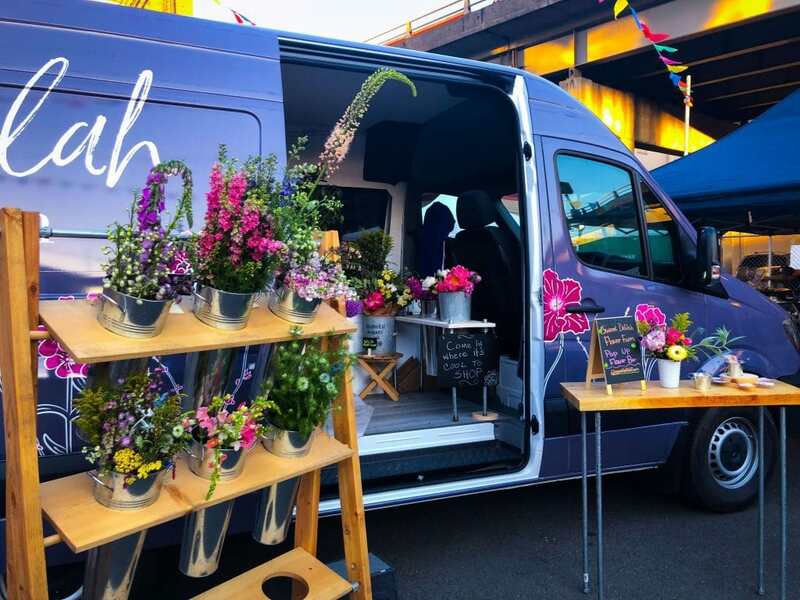 It’s not your typical florist truck, but more like a food cart or food truck, but for flowers. She takes the truck around town and sets up shop. 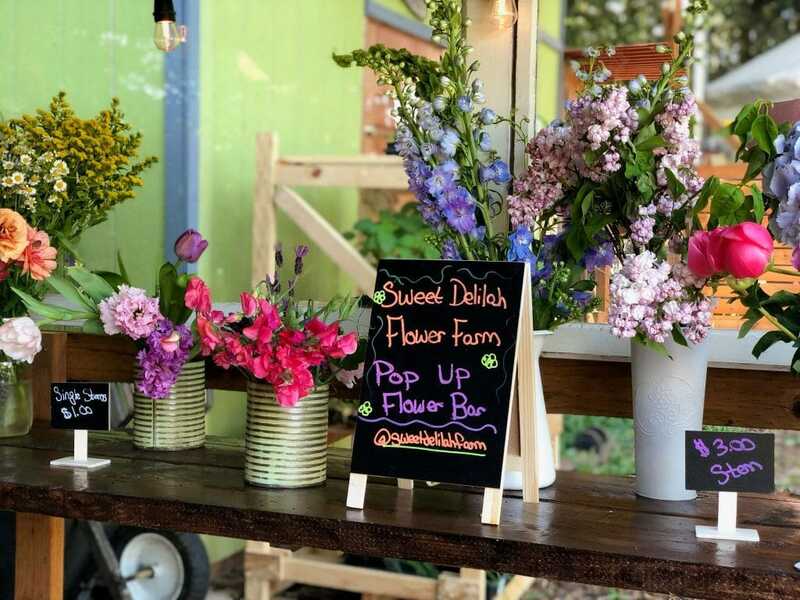 You can go inside the truck and shop for flowers, or you can visit for a flower happy hour or a special pop-up flower bar. A Flower Bar? Well, a flower bar is a class for making your own bouquet, and is just one of Chelsea’s creative ideas for getting us connected with flowers. Chelsea also teaches classes for making flower crowns and for making your own bridal bouquet. You can even book a flower bar for your next event or party. I was amazed Chelsea has only had her farm for a few seasons. While chatting with her at the farm, the farm felt more mature than that. It just was so full of life. Even more amazing was how it also felt like an expression of Chelsea. Even after chatting with her for an hour or so, I sensed her connection to her farm – an almost spiritual connection to the flowers, the herbs, and all the life living on the land. I asked Chelsea what her plans are for the farm. Chelsea says farming is unpredictable. This year she’s had more pests and dealt with a very different weather pattern than in her first season. But, she has plans to expand, teach more classes, and eventually own her own land. Despite the unpredictability, the farm thrives, and Chelsea thrives along with it. I could see her passion in her eyes as we spoke about how she was getting to know her flowers and learning their secrets. I even got a brief tour of the farm before I left. As she showed me around, she spoke softly yet passionately about her farm. I think her flowers were listening. Connect with Chelsea Willis and Sweet Delilah Farm. Follow her on Instagram and Facebook,.